The harsh reality of defaulting on student laons. This is a cautionary tale of the consequences of defaulting on education debt, based on the experiences of seven borrowers of federal and private student loans. The stories are all true, but names and inconsequential details have been changed to protect the borrowers. Education debt is a necessary evil. Most students graduate from college with student loan debt. The bottom line is that college means debt, since student loans are unavoidable for all students except for those who come from the wealthiest of families. If education debt is evil, then defaulting on your student loans is a one-way ticket to hell. The following borrowers have each encountered some of the more horrific consequences of defaulting on federal and private student loans, in most cases through no fault of their own. The toll is not just financial, but extends into their personal lives and affects their families too. Revenge of the Universal Default Richard graduated from undergraduate school with little debt, having attended an in-state public college. But his career aspirations in the social sciences and humanities require a doctorate, and attending the top graduate school in his field meant a move to New York City. The only available financial aid involved borrowing federal and private student loans, and a lot at that. To try to make ends meet Richard also worked 30 hours a week. Even so, he accumulated a hefty balance on his credit cards on top of the student loans. Moving out of New York helped cut his costs, but not by enough. An attorney advised him to file for bankruptcy on the credit cards, telling him that he’d then have some breathing room to complete his education and begin repaying the student loans. The attorney said that bankruptcy would not prevent him from continuing to get federal student loans, but it would likely disqualify him from obtaining any further private loans. 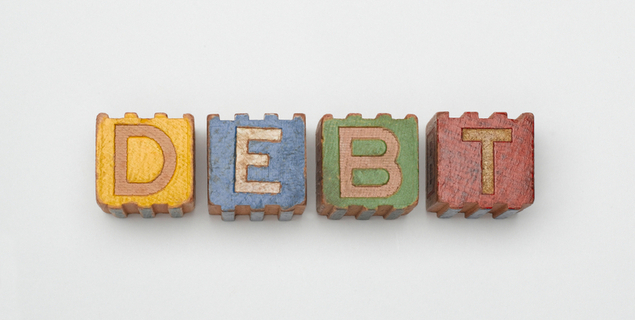 (If credit card debt is your only reason for filing for bankruptcy, don’t do it. If you simply stop making payments on the credit cards you’ll be no worse off, and you may be able to negotiate with the credit card issuers to reduce the payments to a more manageable level.) To his surprise, it turns out that his private student loans had a universal default clause. (Universal default clauses were banned for credit cards and open-ended consumer credit plans by the Credit Card Act of 2009 but not for private student loans.) After Richard’s Chapter 7 bankruptcy discharged his credit card debts, the holder of his private student loans told him that he was now considered in default on his private student loans because of the bankruptcy filing. As a result, his private student loans were now due and payable in full even though he was still enrolled in graduate school. Even if he hadn’t filed for bankruptcy, he would have had only a few years left on the in-school deferment, since his private student loans capped the in-school deferment at four years. He has been forced to take leaves of absence from the graduate program to work full-time to deal with his debt. The heavy work load and stress from the oppressive debt has prevented him from finishing his doctorate. He’s now living in another country while he works on his dissertation. He’s thinking about staying there after he graduates because he won’t be able to maintain a normal lifestyle and also repay the private student loans given how much the collection charges have caused the balance to grow. (He has not and does not intend to default on his federal education loans.) Richard offers several lessons to future student borrowers: Read the fine print on your student loans carefully, especially any limitations on the duration of the in-school deferment and also any universal default clauses. Be aware that graduate school in the social sciences and humanities is likely to lead to a heavy debt load. Try to find a way to focus full-time on your studies, as dividing your attention between work and school will cause delays in completing your degree. The Resurrection of the Settled Debt Nancy graduated with about $70,000 in federal and private student loans in 1993. The federal and private student loans were originated by the same lender. The lender never clearly drew a line between the federal and private loans, often using the same forms to apply for both types of loans. She defaulted in 1995 because she was unable to both repay the student loans and pay for basic living expenses. She tried negotiating for a temporary reduction in her monthly payment until she could get her career off the ground, but the lender refused. The lender filed for a default claim on the federal loans in 1996 with the state guarantee agency. After Nancy rehabilitated the loans by making a year of full voluntary on-time payments, the guarantee agency sold the federal loans back to the original lender. With her parents’ assistance she was able to settle her debts in 2003 for $65,000. The lender told her that all of her student loans would be paid off in full, and the settlement letter and her check were both annotated “in satisfaction and accord of all student loans.” But in 2004 she received a demand letter from her state guarantee agency asking for $100,000. She hired an attorney to get the collection agency to stop harassing her at work over the debt that was supposed to have been paid off in full, to no avail. She was ultimately let go by her employer because of these “outside activities.” (Federal law bars employers from terminating employment because of a wage garnishment order. However, the termination occurred because of events preceding the wage garnishment order.) When the guarantee agency informed her that her wages would be subject to an administrative wage garnishment order, she asked for a hearing. The guarantee agency did not send out a timely notice of the hearing; her attorney at the time received the letter on the day of the hearing. The guarantee agency also tried changing the venue to a different state. She eventually was able to get a hearing, but the supposedly independent administrative law judge told her that the purpose of the hearing was just to inform her of the wage garnishment amount and the date it would start. (Federal law requires the guarantee agency to prove the existence and amount of the debt and it allows the borrower to dispute the existence or amount of the debt.) The guarantee agency did not have copies of any of the original loan documents signed by the borrower, nor any documentation of the default claim paid. Rather, they had only a computer printout (“business records”) of amounts they asserted she owed, some of which were clearly erroneous and were not corroborated by any supporting documentation. The administrative law judge said that he would abstain from making a decision and would allow the guarantee agency time to figure out what had happened. However, about a month later the administrative law judge rendered a decision in favor of wage garnishment without reconvening the hearing. This decision was not supported by the evidence. When Nancy complained to the office of consumer protection of her state’s attorney general she found that the attorney general has an inherent conflict of interest because of obligations to the state guarantee agency. The attorney general represents the state guarantee agency, not the consumer. Since then Nancy has filed suit in federal court, seeking a temporary restraining order, injunction and declaratory judgment against the guarantee agency. Unfortunately, she can no longer afford an attorney, so she’s representing herself in court (pro se), while the guarantee agency is represented by the state attorney general. This is an unfair fight. It appears that the lender may have applied the settlement funds to pay off the private student loans in full and then filed a default claim on the federal student loans. The guarantee agency appears to have paid $45,000 on the default claim and then tacked on more than $63,000 in penalties, charges and interest. Adding to the confusion is the fact that there were two default claims paid on the same loans to the same lender, once in 1996 and once in 2004. Default Due to Identity Theft affects Security Clearance Robert is an active duty member of the U.S. Air Force with 15 years of service to our country. He borrowed several student loans in the late 1980s and early 1990s to pay for graduate school. He paid off these loans in full. When he applied for a home mortgage in 2004, however, he discovered that there was a defaulted student loan in his credit record totaling more than $150,000. He believes he is the victim of identity theft from when his wallet was stolen in 1994. He contacted the state guarantee agency who refuses to offer him any options other than to repay the debt. Even though the debt is not his, he began making payments on it because financial irresponsibility can lead to discharge from the Armed Forces. This debt situation caused a long delay in the upgrade of his security clearance from Secret to Top-Secret because of the impact on his credit rating. The Higher Education Reconciliation Act of 2005 amended the Higher Education Act of 1965 to provide for a discharge of federal education loans resulting the crime of identity theft committed against an individual. However, the US Department of Education implementation of this discharge provision requires the victim to obtain a court judgment that finds that the individual was a victim of identity theft and that identifies the names of the perpetrators of the crime. Due to these stringent requirements, this statutory change does not provide meaningful relief to most victims of identity theft. The Federal Register does state that “the individual who is the named borrower on a FFEL or Direct Loan that was falsely certified as a result of the crime of identity theft is not liable for a loan that borrower did not execute or authorize another to execute on the borrower’s behalf, whether or not the loan is discharged based on a crime of identity theft” and that “an individual who can demonstrate that his or her signature was forged on a FFEL or Direct Loan note is relieved of the debt under common law and State laws against forgery.” But in practice state guarantee agencies seem to ignore this discussion and require repayment of the debt. The Burden of Collection Charges John borrowed $37,600 to pay for his education, graduating in 1995. A few years later he defaulted on his loans due to a variety of unfortunate circumstances. A few years after that, he rehabilitated the loans. However, in the 10 years since he entered repayment, he’s paid a total of more than $54,200 on his debt and still owes $25,000 on the debt. By the time he’s paid off the debt in full, he will have paid a total of more than $100,000. If he hadn’t defaulted on the debt, his total payments on a 10-year term would have been a little less than $54,500. The difference is due mainly to collection charges of up to 25%. The consequences of default have also taken a toll on his personal life. When his wages were garnished he was unable to pay his child support obligations, causing a great deal of stress. (While federal regulations allow employers to comply with family support orders, in practice the wage garnishment amounts do not consider child support obligations, leaving very little money available to pay bills.) He has also not been able to buy a home or new car or get a credit card. This is very frustrating for John, who says, “I didn’t get $100K worth of education — why should I pay for it?” He wishes there were some sort of amnesty for defaulted borrowers who have paid their debts.